I just wanted to say a quick thanks for the article. I got my foundation license last month and after reading this I just had to give the J Pole a go. I got around 1:1.2 SWR without tuning which it is a good start and as good as a commercial dual band aerial I got over the counter. Congratulations on getting your foundation licence! Good job with the J-Pole too! Have you had any feedback from hams that built this for 14.2 Mhz or 28 Mhz. No, but I would love to see one for 14MHz! Thanks for the fantastic calculator John! I just built myself a J-pole from scrap pipe, and it tunes up beautifully across the entire (US) 2M band. Worked a repeater 50+ miles away on 7 watts. The clothes pin Yagi Uda is next! Nice one Matt! I’ll have a look at the videos. Good luck with the PegTenna! You mention that “Just remember, when adjusting elements, 1cm shorter on ‘C’ would equal 3cm shorter off ‘A’” but at the same time state that tuning is done “by adjusting the length of the 1/4 wave stub ‘C”. So if one needs to adjust the length C for tuning purposes, must the length ‘A’ also be adjusted (by a reciprocal threefold amount)? You also state “Just remember the whole antenna needs to be in the clear, away from any objects, especially conductive objects!” – what about the trunk of a tree? – Would that be considered “conductive” and/or be detrimental to the antenna’s performance? I am planning to build one for 28,5 Mhz. (Given the solar cycle… no hurry!). The calculator will get you close. For easiest tuning, adjust the 1/4 wave stub and the feedpoint height. Between them, this should be enough to reach 1:1 SWR. In answer to your question, no. A should be close enough with the calculator. I would only adjust A if you were having problems. A tree would affect performance, but it should be OK. Give it a go! You might find when it rains, SWR changes a bit, due to wet branches and leaves etc. I have not tried one on 28MHz, but would like to know how you get on! 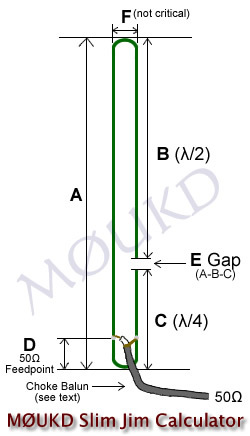 what abuot the gain of the antenna .. and how it measure ?? Gain will be around 2.15dBi, same as a centre fed half wave. I was wondering if you had a 75Ω coaxial version of your calculator? No, but it will be very close to the 50Ω point. we (few of us from Hyderabad,India) tried to make the slim-jim antennae for 145.0MHz. In specific, we tried using 14swg single strand copper wire.on 1″ pvc water pipe. The feed point i tried at 10cm it worked reasonable but swr was not optimum. 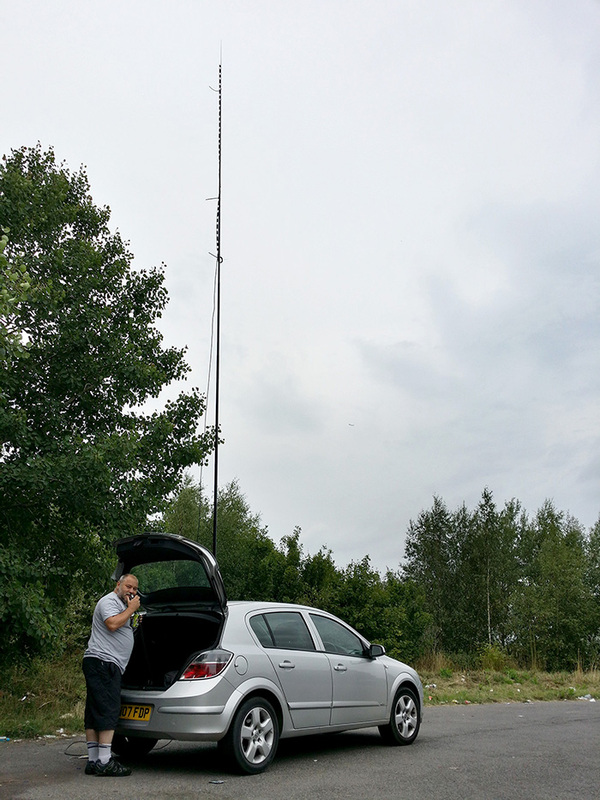 another case, we tried at 5cm , SWR was fine , but antenna reception was rather bad. Earlier your calculator was showing 10.3cm for terminating RG-58/u. Later as per one of your replies, you had modified the calculator and it shows 5cm now. the formula used by you (Lamda/40)*V.f works out to 5 cm only. but we could not optimize the antenna. could you show little more thought with using bare 14 swg wire, please ! Unfortunately, with differing conductors, placed near plastic or in tubing etc., it is hard to calculate. The calculator is optimised for 15mm copper at 145MHz. Experimenting and (hopefully) finding a good resonant match may be the only way I’m afraid. I built the Slim Jim 450 ohm line for a friend. Got 1:1 SWR from 144-147. Tried with a repeater 64 km away with 5 watts. Excellent!!! 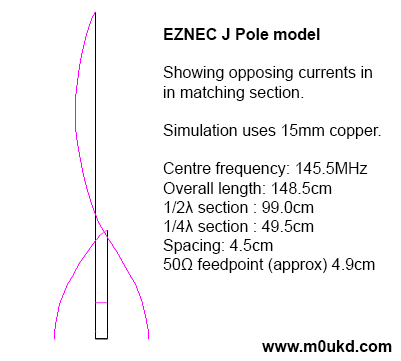 Now I am going to build one for myself for VHF and UHF to replace my old J pole. Glad your build went well, thanks for the update! OK Thanks for the suggestion. I might amend the calculator at some point. 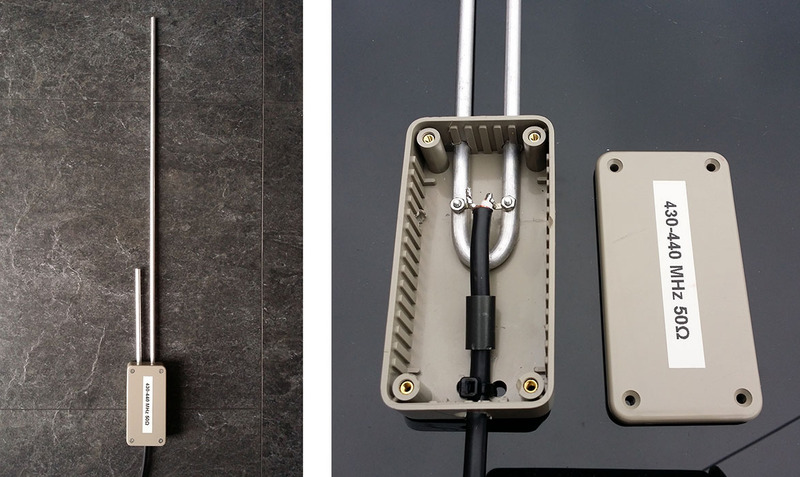 Slim Jim a nice antenna for 2 meters band, may I have that caculator for Slim Jim antenna…?, just send to sambolang64@gmail.com Thank’s. I have just run the calculator at 315 Mhz. for a remote gate opener. The provided antenna is just a piece of wire which gave me coverage of about 50 meters. I did replace it with a magnetic whip at about 1.8 meters high and it gives me about 100 meters. I will now redo it with the receiver built into the plastic water proof box right at the feed point and mounted at about 3 meters high. I will report back on results. Would it work as well if a SO-239 were soldered on instead of the coax directly? Yes it would be fine to use 75 ohm coax, ideally you would match it to 50 ohm at the radio end, if you have a 50 ohm transceiver that is! I am new to ham radio this time around. When I left for life, college and military, SSB was new and FM was rare. So with new license on the wall I used the calculator to build a 6 Meter J Pole from .55 copper pipe. Beautiful to the eye. Got it in the air and on the air in time for a local 6 meter net. I could hear the moderator and lots of attendees but I could not join the net. In the middle of the night I realized everyone was using horizontally polarized antennas and mine was vertical! 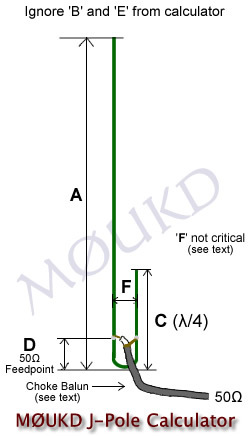 Now I see a J Pole might not be the best antenna for horizontal polarization on that band. turn it sideways. it will work. La antena es caño de aluminio. Esteticamente es un poco grande pero no mas que la antena BC 3 que tenia en uso. No tuve problemas de calibración y siguiendo las medidas obtuve una ROE de 1:1 para la frecuencia calculada (EXCELENTE). La verdad que promete mucho ya que en comparación con mi antena anterior obtuve mas sensibilidad en recepción RX y mejore mis comunicados en DX con mi Ranger RCI-2950 de 6 Watt en AM. Le dejo mi saludo y cualquier duda le estaré concultando. Soy Leonel de la Rep. Argentina Pcia de Santa fe. Hi, and thanks for the calculator and the instructions. I am trying to make a 450mhz antenne to use in order to improve the signal from my internet provider that broadcast 3g over the 450mhz band. Lately they actually started to broadcast 4g as well on higher frequencies. Since I dont have a direct view and live about 22km from the transmitter, I was thinking that my chances are better with the low frequencies. I have made a Slim-Jim that is ready for testing after tomorrow. I dont have equipment (or the knowledge) for tuning the antenna, so I guess the antenna will be as it is. I have made it according to the measurements from the calculator above, but I was using a 6.5mm copper pipe. Bending this pipe resulting in the ‘F’ getting 3.2cm instead of 1.4cm. However this is said not to be critical, but it could have an impact on where the feeding point should be. But I didnt find any information telling if the feeding point ‘D’ should increase or decrease when increasing ‘F’. You mention that the calculator is optimized for 15mm pipe. But do you use the outer measurements for the lenght, inner or center? For spacing I guess it must be inner measurements, since its impossible to get 14mm spacing between the center of two 15mm pipes anyway. Also there mention of using a choke, 3 coils for 145mhz. But is any choke recommended for 450mhz? Wow, interesting application. Yes, the measurements should be from the inside, the shortest path for current to flow. A choke is not essential, so I would omit it in your case. Dear Friend, so good your comments and the calculator! The idea of insert a j-pole in the box, is the must!!!! calculator and hint of a nice slim jim antenna, really helped me. I made from 9 mm aluminum pipe with size and shape according to calculation, make measurements on 1: 1.1 swr meter and have a further range. I am very happy once again, thank you. and success is always for you, John.good lock form indonesia. Curious what the effect on dimensions for using 22.22mm Copper Tubing? I remember seeing an on-line calculator that took element diameter into effect. The Slim Jim I am working on is for 50.1Mhz. Good luck with your build. 73, John. 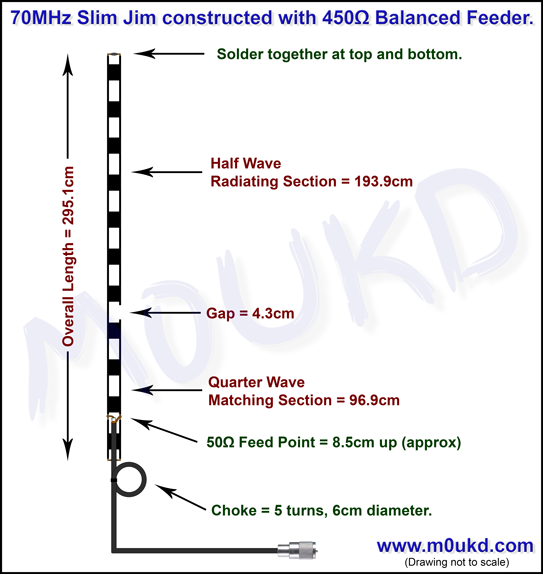 Thanks John, I designed for 50.1mhz about 14′ overall, hope to have it finished today.